Nha Trang city is one gleaming gem of Vietnam with its palm-lined beaches, crystal-clear water and soft, white sand. If your wanderlust is itching for a new experience to enjoy the salty breezes and pristine beaches, Nha Trang is the place to be. Here is what you need – Nha Trang Travel Guide. Where is Nha Trang City? How to get to Nha Trang? How to get around Nha Trang? Is Nha Trang worth a visit? Nha Trang is the seaside city of Khanh Hoa province. The province itself occupies a portion of Vietnam’s coastal attractions with its neighboring provinces: Phu Yen, Dak Lak, Lam Dong and Ninh Thuan. As for Nha Trang, it is adjacent to Ninh Hoa District, Cam Ranh Town and Dien Khanh District, with the Eastern Sea hugging its outer edge. Nha Trang and their vicinity are quite high compared to sea level. It makes venturing to Nha Trang become difficult. However, the geological height also helps shelter the city away from the effects of violent winds and create a pleasant climate to spur tourism. Evidently, Nha Trang is affected by less than one major storm per year. In response to the country’s burst of economic growth, Nha Trang’s skyline now dons a new look. Since 2009, apartment complexes, shopping malls and renovated neighborhood have helped propel the population passes the 500,000 marks. An enchanting modern Nha Trang at dusk. As a result of its tropical savanna and oceanic influence, Nha Trang’s climate consists of only two seasons: dry and rainy. While the dry season usually last for six months (January to June), the rain starts pouring as soon as July and continue to December. Do keep in mind that July and August are two of the hottest months in Nha Trang. Therefore, if you’re planning a summer trip in July or August, make sure to pack hats, sunscreen and sunglasses. In addition, bring an umbrella or light raincoat along, with chances of downpours and tropical storms. Knowing all of this, the best time to visit Nha Trang is between February and April, when rainfall is still low and the temperature is kept mild and pleasant at around 26 degree Celsius. It is also great for a visit to the coral reefs at Mun Island, South Reef or Small Hill. Sunshine and warm breezes are never hard to find in Nha Trang. Suppose your starting line is Sai Gon, which is more than 400 kilometers away from Nha Trang, you will spend between 9 and 11 hours of arriving by sleeping bus or train. A one-way ticket to Nha Trang via buses can range from 232,000 – 278,500 VND (~10 to 12 USD) while a train ride can set you back as much as 696,000 VND (~30 USD). Another option, also the fastest one, is flying on an airplane. You can opt for a direct flight within one hour for 580,000 – 1,116,000 VND (~25 to 50 USD). Vietnam Airlines and Jetstar Pacific are the most popular airlines that offer flights to and from Nha Trang. One other thing to keep in mind, should you choose to fly, you will not arrive at the central Nha Trang just yet. As Cam Ranh Airport is 30 kilometers South of Nha Trang, you will either take the bus or a taxi to the city. For the taxi, it can be quite expensive if you’re travelling alone as you can expect as much as 300,000 VND (~13 USD) for a 45-minute trip to the city. As for the bus, the best option is to buy a 50,000-VND (~21,5 USD) ticket for a shuttle bus named “Dat Moi” at the reception desk at the airport. Then jump on bus 18, and hop off at bus 10, Yersin Street. As for getting around town, Nha Trang offers plenty of options for you to choose. First, there are taxis with reliable services. Taxis companies supply the large number of drivers, it means you can easily catch a taxi and don’t need to wait for a long time. As a plus, they are English-speaking drivers which is easier for you to communicate and get to your destination. However, this choice is not very budget-friendly. For the first 30 kilometers, it costs from 14,000 VND (~0.58 USD) per kilometer. After the initial kilometer marks, the price will be reduced to 7,000 VND (~0.34 USD) per kilometer. Tips from Inspitrip: Choosing taxi will help you avoid the hot weather and fits with a group of friends. If you travel alone, prepare for yourself a note with address written down, a google map app and a suitable price to deal with the driver. You can ask the hotel’s receptionist for an ideal price to reach your destination. No matter how pedestrian friendly Nha Trang is, there would be times when you just don’t wanna walk under the burning sun. That is why buses, most are equipped with air-conditioning, comfortable seating and cheap fare, are the wonderful option. It will cost you maximum 16,000 VND (~0.69 USD) per trip. That said, taking a bus in Nha Trang is not without difficulties. The majority of signs are still only available in Vietnamese as well as the drivers who can only speak Vietnamese. This is why having a google map and a translation app beforehand is a must. Be sure to keep checking your belongings as pickpockets are common in Nha Trang. Additionally, buses only operate until 6 p.m and can be really crowded during rush hours. Make sure you planned your schedule and will not miss any bus. Though this is an amazing way to take in the scenery, sitting behind a stranger while weaving your way through traffic can be quite daunting. However, if you’re up for it, here is what you should know. You can hire a driver straight from the streets. Simply walk towards, tell where you need to go, preferably with a map or translated messages and negotiate a price. The wonderful thing about ‘xe om’ is feeling like a local. However, there is the risk of being overcharged and the route or length of the journey is completely up to the drivers. So make sure to check your map, and be ready to walk if the price is too steep. Sitting on the back of a motorbike is definitely a memorable experience for first timers in Vietnam. The better alternative for this is using the ride-hailing app such as Grab. In Southeast Asia, it is the most popular and reliable one that you should use. What’s great is that it lets you know who your driver is, how much you will be charged, and pick-up information. Therefore, every transaction is clear and you can forgo the haggling. Remember to buy a local SIM card with mobile data if you wanna get around by Grab. It supports the login process and a phone number for driver to contact you. Consider to book a Grab during rush hours due to the surge price and slow pick-up. Dear adventurous souls, renting a bicycle or motorbike is the option for you to explore Nha Trang at your own pace. Having more freedom in exploring means that you need to know where you’re going. It’s time to think about a well-planned itinerary or finding a local guide. And for every time you rent a bike, you will be required to pay a deposit and present your ID, passport, etc. As such, be careful of scams and obey traffic regulations. Depending on the type of motorbike, prices can range from 70,000 to 163,000 VND (~3 to 7 USD) for 24 hours. Wanna travel like a local, try renting a bike! Being such a touristy city, Nha Trang is in no shortage for accommodation. Here are three major areas to note when looking for accommodation are Tran Phu Beach, Nha Trang Bay and Islands, Nha Trang center. While Tran Phu Beach promises thriving nightlife and many spectacular resorts, it can be quite crowded and susceptible to traffic jams. What’s more, Tran Phu offers plenty of restaurants, budget hotels as well as activities for you to enjoy. With lots of traffic passing by, Tran Phu Beach is the perfect place for those who loves noisy and bustling urban centers. The best things about Tran Phu is variety of accommodation which range from 550,000 to 5,500,000 VND (22 to 254 USD) per night. An oceanic view is next to you. Despite being private and quiet, the area is mostly oriented towards affluent travellers and families. This area of Nha Trang is also connected to Vinpearl Land by the Vinpearl Cable Car. Additionally, famous landmarks, bays, such as Van Phong, and islands, like Hon Tre, Hon Tam, can be reach via ferries. Prices for accommodation here can be as high as 16,000,000 VND (~689 USD) and as low as 900,000 VND (~43 USD) per night. Immerse yourself in the gorgeous nature from Nha Trang resort. Nha Trang City, on the other hand, is very suitable for backpackers and on-budget travellers. Travelling on foot or renting bikes are made viable because a number of popular attractions are within walking distance from the majority of hotels in the area. However, despite its vicinity to Ponagar Tower or Cho Dam market, the area lacks high-quality hotels and resorts. If you plan on staying here, expect a price range between 600,000 and 1,000,000 VND (~26 and 43 USD) per night. Not luxury, but you will fall in love with the creative architecture of these hotel. Now that you have been imbued with all the essentials for a trip to Nha Trang, here comes the juicy part of this Nha Trang Travel Guide. Nha Trang is not just beaches and resorts. It also offers a variety of activities to quench your thirst for exploration. Below are a few of the many exciting things to do in Nha Trang. Ticket price: 880,000 VND (include two-way transport via cable car, full access to every rides at the amusement park and Vinpearl Water Park, ect). Vinpearl Land is a five-star resort, an amusement park, a water park, and a shopping center combined into one luxurious amalgamation residing on Hon Tre Island. Off the coast of Nha Trang, the island and its five-star extravaganza can be reached via speed boat, ferry or 3320-meter cable car which is the longest transportation across the sea. A Hollywood-inspired scene at Vinpearl. Inside its two-hundred-square-meter grand complex, you will find distinctive areas of enjoyment: The Vinpearl Land Water Park with breathtaking man-made mountain system; Vinpearl Land Nha Trang with the biggest Ferris wheel in Vietnam and the largest coaster in South East Asia; also the staggering 3400-square-meter aquarium with over 300 marine specimens. It will take one day or even more to discover all these attractions, so plan well without missing anything! Vinpearl alone is worthy of trip Nha Trang. The Ponagar Tower or Temple is a remnant of the pre-existed Champa Kingdom, which occupied a portion of Southern Vietnam before becoming a part of Dai Viet’s territory in AD 1832. The whole Tower complex holds a significant spiritual value to the local ethnic group, the Cham, as it is the place for special occasions, solemn ceremonies and pilgrimage. Boasting some stunningly intricate Cham architecture, the Ponagar Tower can be found on Cu Lao Marble Hill, Vinh Khanh Ward, 2 kilometers North of Nha Trang. The tower is accessible via bike rides, taxi or the bus route number 4, which runs through Hon Xen, Nguyen Thien Thuat and Vinpearl. If you’re planning to include this attraction in your trip and want to fully explore the site, pay Inspitrip a visit. Long Son Pagoda or The White Buddha Pagoda is the most renowned pagoda of Khanh Hoa Province. Nesting at the foot of Trai Thuy Mountain, roughly 400 kilometers from the railway station, the pagoda houses the Gautama Buddha, which is a 24-meter-tall, white concrete statue of Buddha in meditation position. Such is the sheer size of it, the sculpture is visible from afar as one makes their way to the pagoda. As mentioned above, Nha Trang is known for good weather and favorable geography. As such, marine life in Nha Trang, Khanh Hoa prospers with gusto, paving the way for scientific studies and researches. A visit to the first and only National Oceanographic Museum will give you a chance to feast your eyes on more than 20,000 live and preserved specimens. Among Nha Trang’s must-see attractions is Ba Ho Waterfall which is comprised of three waterfalls. The famous Ba Ho Waterfall is left untouched except for a few pointers along the walk through the thick forest surrounding the waterfall. And with only a 20-kilometer ride to North of Nha Trang, this waterfall is a ubiquitous spot for hiking, swimming or picnicking. 49 kilometers from the ‘Bac’ National Route lies Doc Let Beach. Exaggeration or not, Doc Let is among the most beautiful beaches in Nha Trang. And along with soft white sand and clear blue water, Doc Let offers a wide range of excitement. 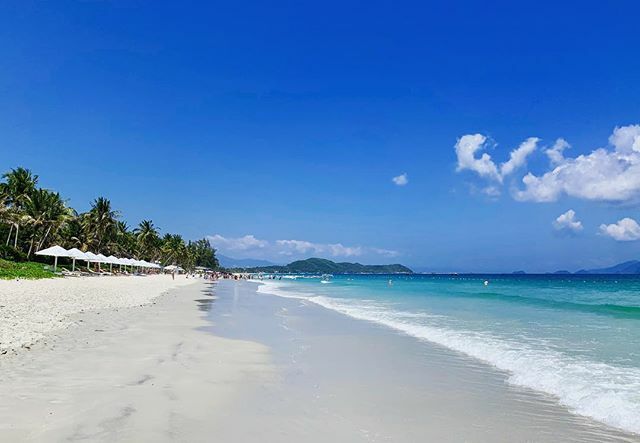 From the luxurious White Sand Doc Let Resort & Spa to jet-skiing across the water, Doc Let can surely deliver a wonderful time, with the promise of fresh seafood and local delicacies. So, come to Doc Let and you will not be worried about the lack of things to do in Nha Trang. A wonderful city and stunning beaches are surely an indicator of thriving nightlife, especially for a young and energetic city such as Nha Trang. Not to let its mesmerizing shoreline goes to waste, Nha Trang takes full advantage of its night time with a selection of chic outdoor bars. The sea of light that is Nha Trang. Two of the most notable mentions are Nha Trang Sailing Club and Skylight Rooftop Bar, both of which are conveniently situated close by each other on Tran Phu Street, gazing over the shimmering sprawl of Nha Trang Bay. And while the Sailing Club offers a combination of open bar and mouth-watering cuisine right on the beach, Skylight takes the party to the sky with a 360 degree view of the entirety of Nha Trang. Good music and good food, Sailing Club could be the highlight of your trip. In Nha Trang, the prospect of a good eat is never low. Nothing said ‘Nha Trang’ better than Nha Trang amazing cuisine. In Nha Trang, there are some unique treats that you cannot miss. The first two things that Nha Trang is known for are ‘Bun Ca’ (fried fish cake vermicelli soup) and ‘Bun Sua’ (jellyfish vermicelli soup). Then, make sure to have a taste of Nha Trang signature seafood pancake or ‘Banh Xeo’, which is topped with, you guessed it, seafood. Last but not least, you have to try Nha Trang’s take on ‘Banh Can’ (smaller version of `banh xeo`), ‘Banh Beo’ (steamed rice cake) and ‘Nem Nuong’ (grilled pork sausage). All in all, Nha Trang is the place to be to pamper your inner foody. A thriving nightlife with rooftop and open seaside bars. To wrap this Nha Trang Travel Guide up, a trip to Nha Trang, with its astounding landscape, great weather, delicious food and abundant amenities, will not be a waste of time. 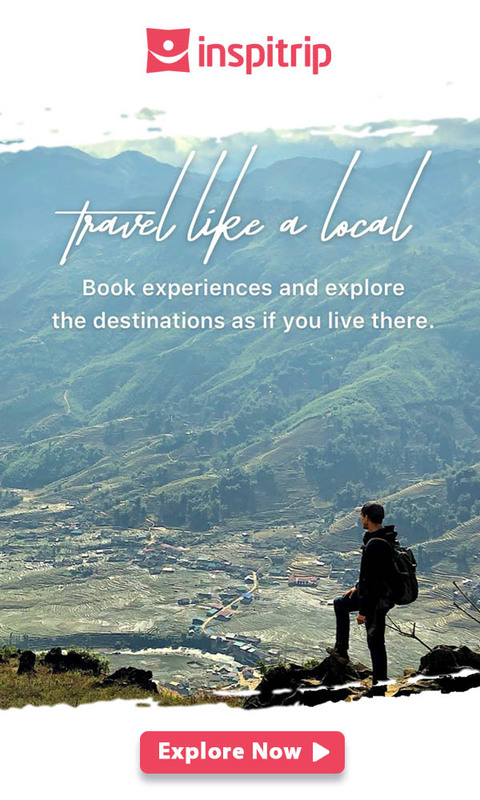 And in case you need any more convincing, check out Inspitrip for affordable, customizable and English-speaking guide included tours to complete your visit to Nha Trang. Visiting Saigon Vietnam: what to do if you only have 24 hours?